Capri, a tiny island in the Bay of Naples, is a well-known paradise. 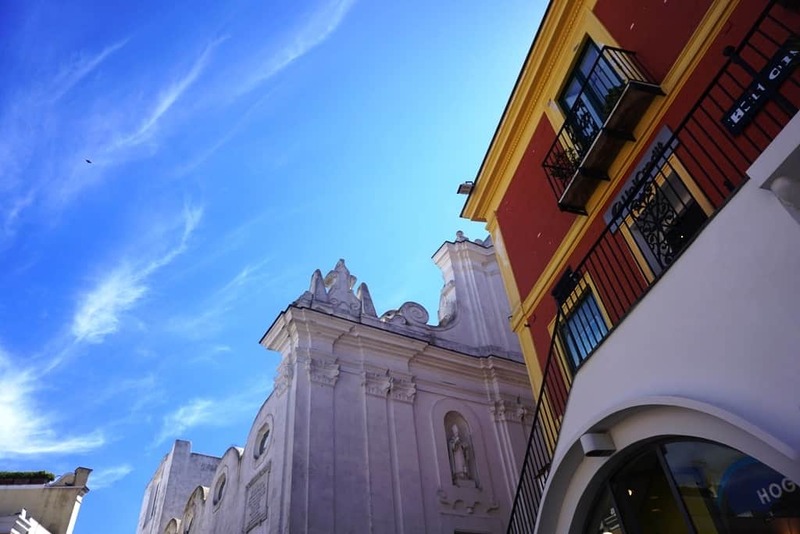 Not only does it boast beautiful natural wonders, but an active lifestyle and culture known for its nightlife, shopping, beaches, and sweet limoncello. 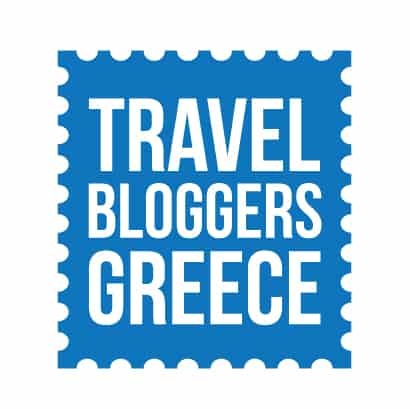 If you’re interested in learning more about this stunning island and some things to do while here, keep reading. Below you’ll find helpful information about the island, how to get around, and some great things you can do while here. There are a few ways you can get to Capri, but most involve taking a boat. You can hop on a ferry from Naples, or Sorrento which will take you on a calm ride to the island. However, during the busy summer months, a few other ferry routes open to help with the demand. These routes mainly are near the Amalfi Coast which takes tourists from this popular area to the island. You can see the ferry schedule and book tickets at www.ok-ferry.com. If you’re feeling more adventurous, you can instead take a helicopter to Capri. This a much faster and scenic way to get to the island, but it costs much more than if you just took a ferry. Capri is packed with fun and unique things to do. Below are some of the top adventures you need to try when here. 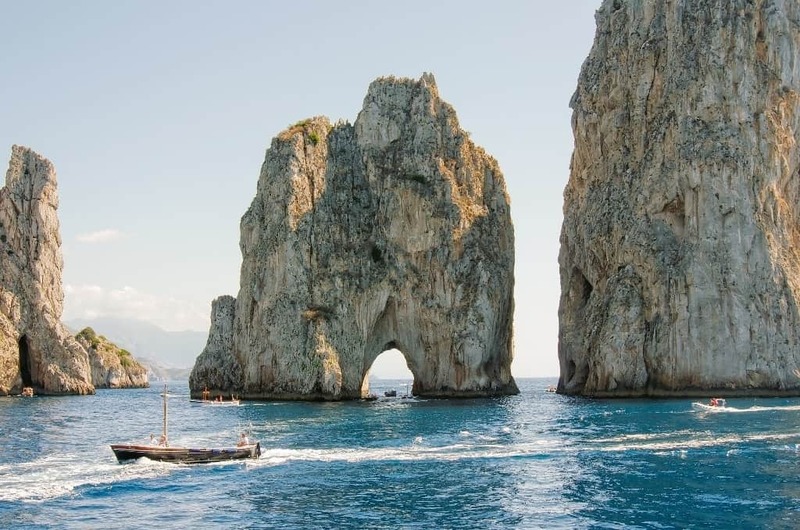 Capri is the perfect place to take a boat ride. You can rent a boat on your own or sign up for a boat tour around the island. 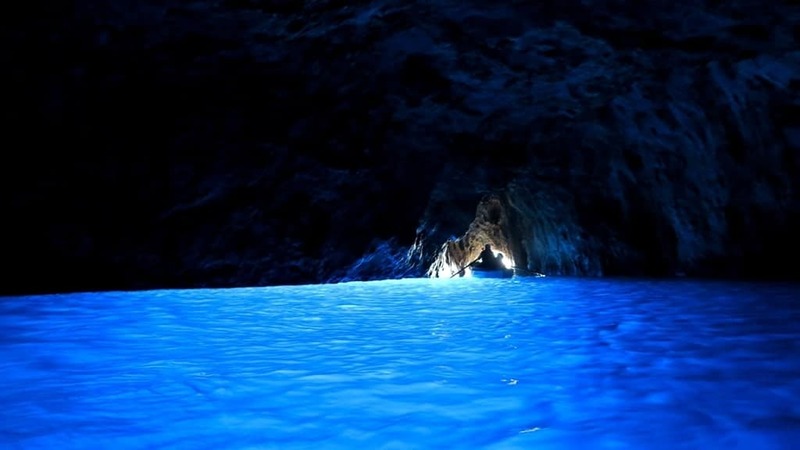 When on your tour, you’ll be able to view some of Capri’s most treasured natural wonders, like La Grotta Verde (The Green Cave), La Grotta Azzurra (The Blue Cave), La Grotta Bianca (The White Cave), I Faraglioni, and Arco Naturale (The Natural Arch). This cave is known for its views of the rugged seaside and the strong winds that blow against the cliffs. You can often take a quick swim around in the greenish-tinted waters after entering the cave. 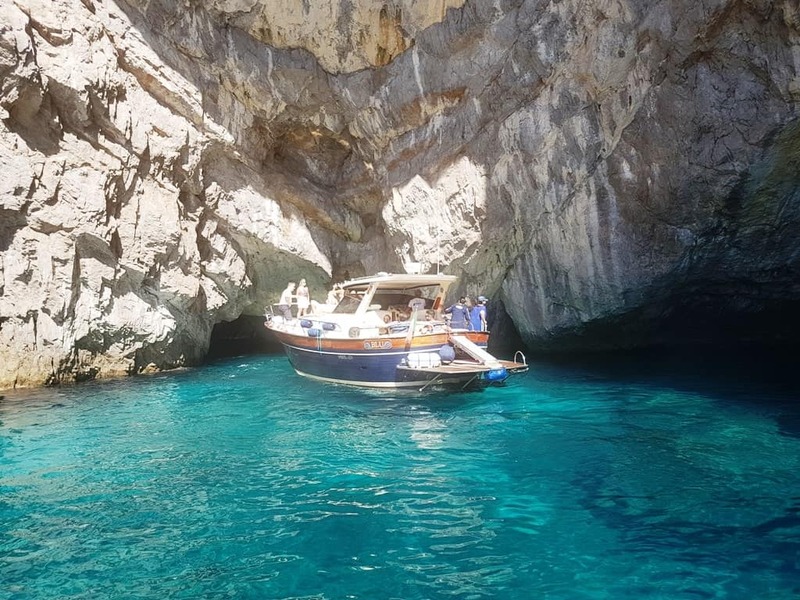 Translated to “The Blue Grotto,” this amazing place features a stunning and almost glowing blue water which you can see on your boat tour. La Grotta Bianca is a cave known for its white cliffs and stalactites that hang from the ceiling inside. The boat will take you into this mysterious cave so you can see its natural wonders for yourself. These large rock formations tower out in the middle of the sea in Capri. You can take a boat ride around these massive structures so you can see them up close. I Faraglioni consists of three rocks: Stella, Faraglioni di Mezzo, and Faraglioni di Fuori. You might even see the Italian wall lizard, a rare blue species, resting on the side of the rocks. The Arco Naturale is a beautiful natural structure which is part of the remains of a former grotto. You can take a boat by it to see the rock’s unique limestone formations. The Blue Grotto is a magical spot on the island known for its sparkling blue waters hidden in a cave. There is a small opening at the top of the cave which allows sunlight to pour in which causes the interior of the cave to illuminate in an enchanting way. To get to the Blue Grotto, you have the choice to either take a boat or walk. You can hire a public or private boat to take you or hike down a staircase that winds down a hill to the grotto. Marina Grande is the main port in Capri. It’s a picturesque site with colorful houses lining the hillside and boats floating peacefully on top of the seawater. You can take a boat ride around the area at the Marina Grande or enjoy some time at the beach relaxing in the hot sand. As the largest port in the city, you’ll also find plenty of restaurants and shops to visit. Known as the “Small Marina,” Marina Piccola is thought to be the spot where Odysseus was called by the sirens in Greek mythology. Marina Piccola is situated near I Faraglioni, so you’ll get a spectacular view of this sight. The area is also known for its warm sea breezes which blow summer-like air even in the midst of winter. Besides enjoying the sea, you can also hike around the local beach which has many secret places you can hide away in so you can enjoy the beauty of nature. 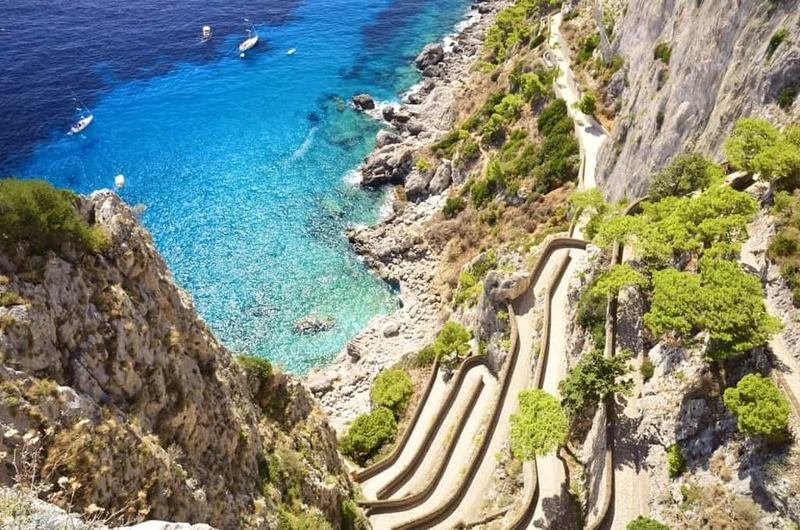 To get to Marina Piccola you can just walk through Via Krupp which is a winding pathway connecting Capri to this section on the island from the Gardens of Augustus. However, keep in mind that sometimes this trail can be closed due to falling rocks. If this is the case, you can easily hop on a bus to take you here. If you’re looking for stunning panoramic views of the island, you’ll want to climb up to Anacapri. 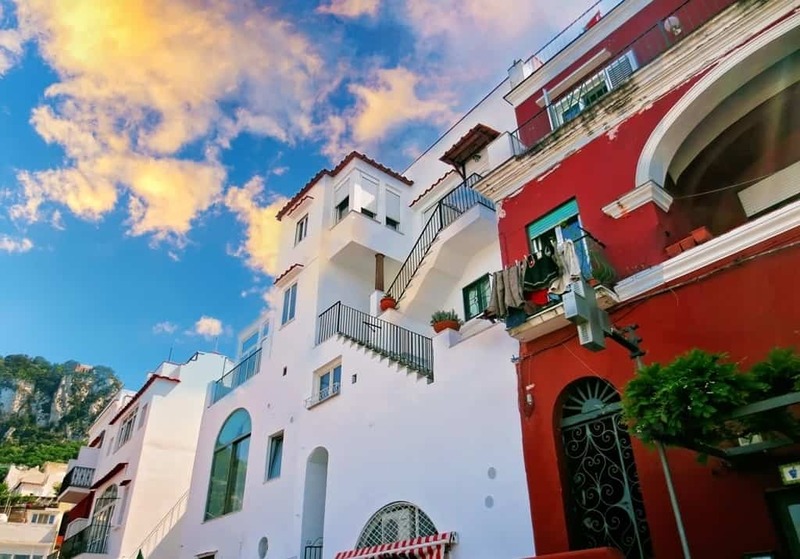 Because it’s at a much higher elevation than Capri, it’s considered to be an independent section of the island. While in Anacapri, you can stop by the Villa San Michele. The former home of Swedish doctor Axel Munthe, this beautiful place now serves as a museum. 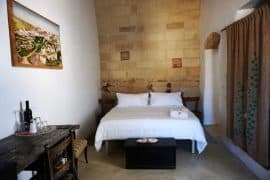 Built on the ruins of a former chapel, you’ll find plenty of historic structures hidden behind trees and plants on its ground, like a Greek tomb and marble columns. You can walk around the home to learn more about its history and former owner or stroll around outside and enjoy the impressive sea view and gardens. You might even see a few unique birds flying by on their way to a nearby bird sanctuary. To get to Anacapri, you can use a few forms of transportation. One of the most popular methods is by bus which will take you all the way up to the top. 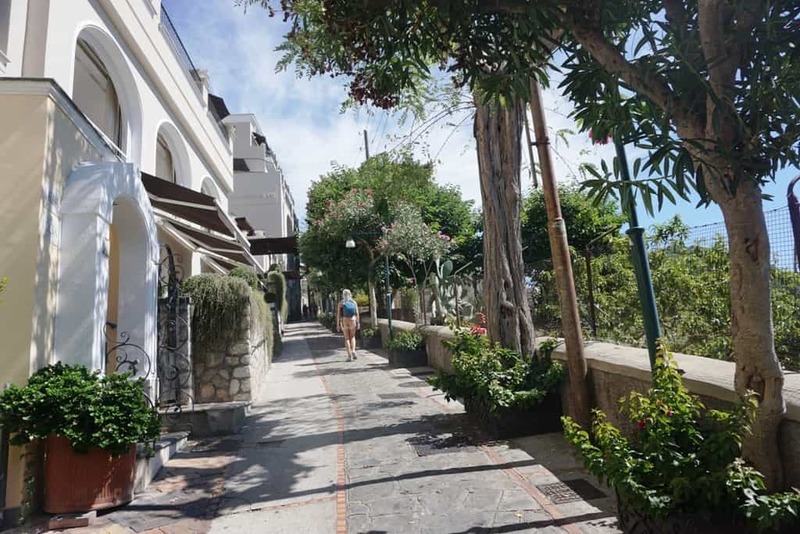 On the other hand, you can also take some time and walk to Anacapri with a special walkway built between the Center of Capri and Anacapri you can safely use. 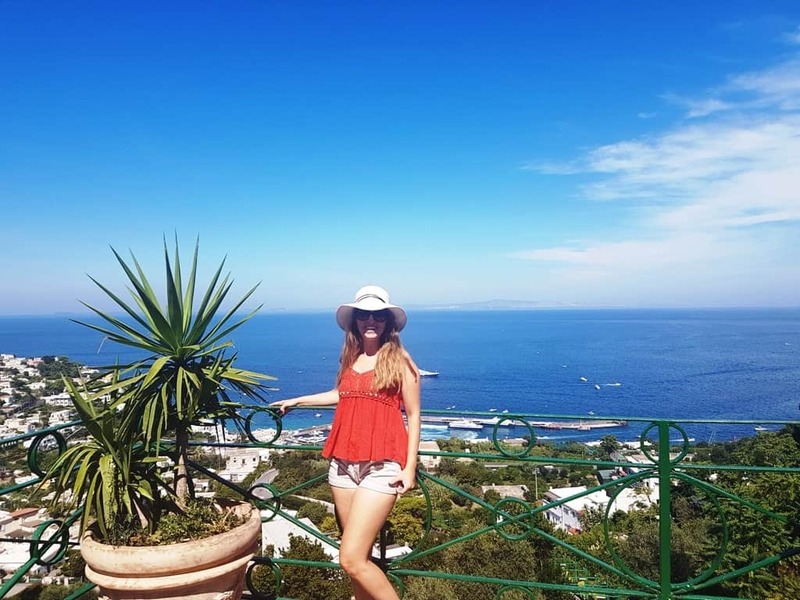 If you’re looking for incredible scenic views while in Capri, you’ll definitely want to take a trip up to Monte Solaro. 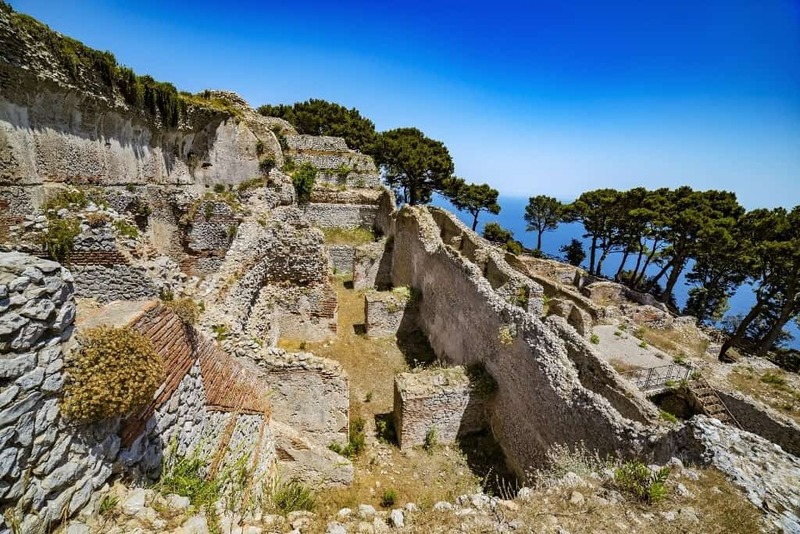 This mountain has one of the tallest peaks in all of Capri and contains historic buildings, such as a blockhouse, that tell of its military importance in the 19th century. Besides Capri, you can even see the nearby Amalfi Coast and Bay of Naples here. 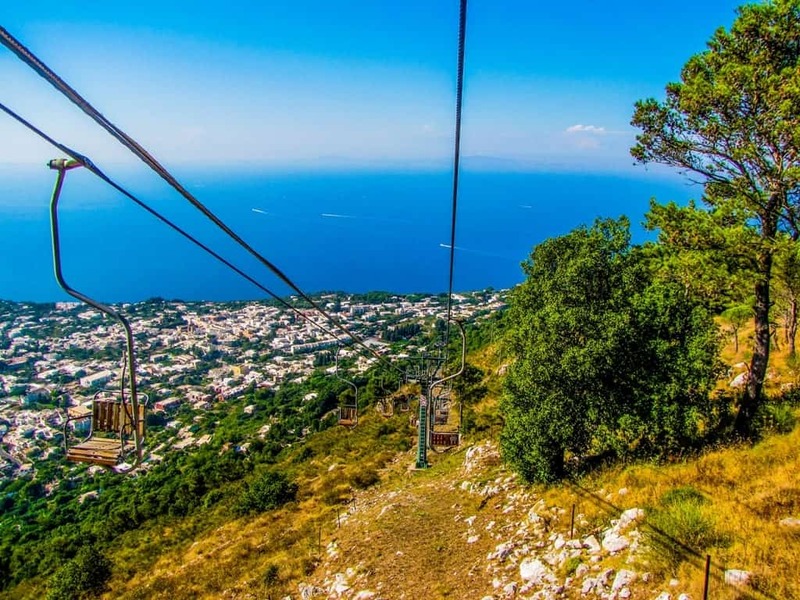 To get to Monte Solaro, you can take the chairlift from Anacapri, which will provide an unobstructed view of the area around you. 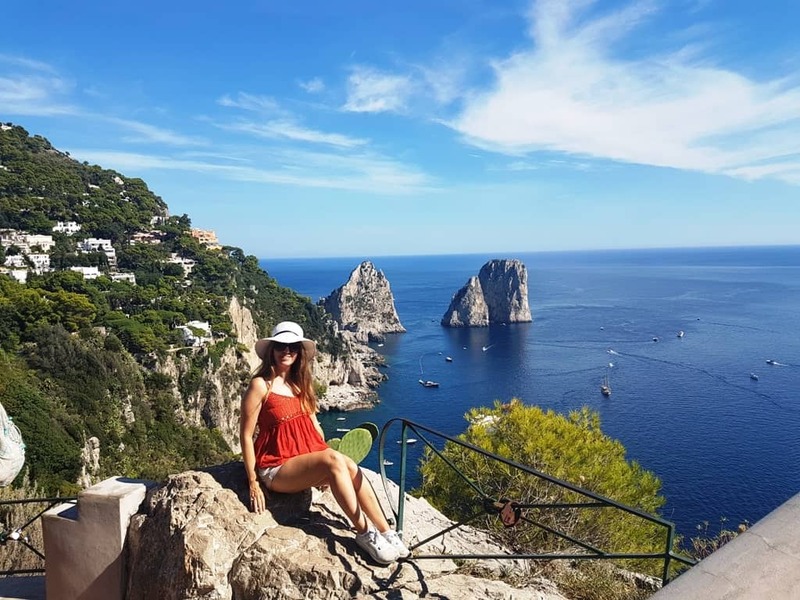 Capri is home to numerous hiking paths, all of which take you to various attractions on the island. Via Krupp is one of the most popular trails to use and will take you by the coast and Gardens of Augustus. When you’re done hiking, the trail will end at Marina Piccola where you can grab a bite to eat or go shopping. Another popular trail to trek on is the trail to the Villa Jovis. 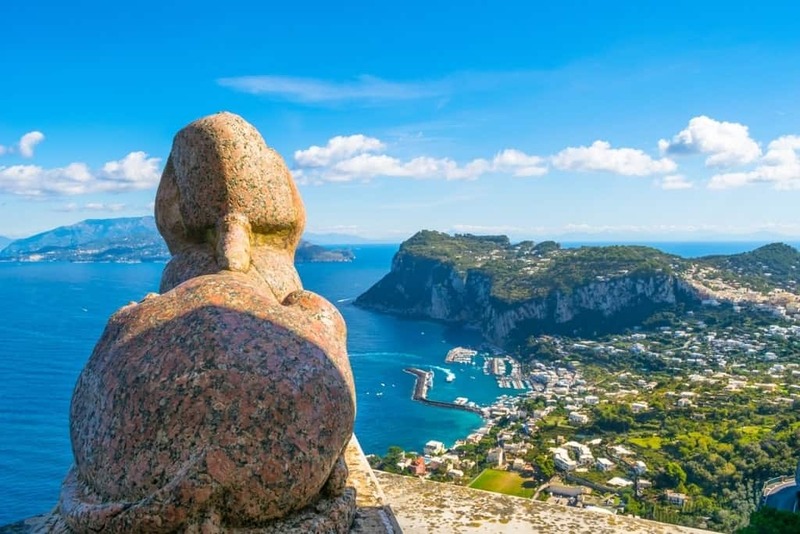 It’s a bit of a long walk, but it will take you to high elevations so you get stunning views of Capri. The trail will eventually take you up to the ruins of Villa Jovis, where you can explore this former Roman castle built by Tiberius yourself. 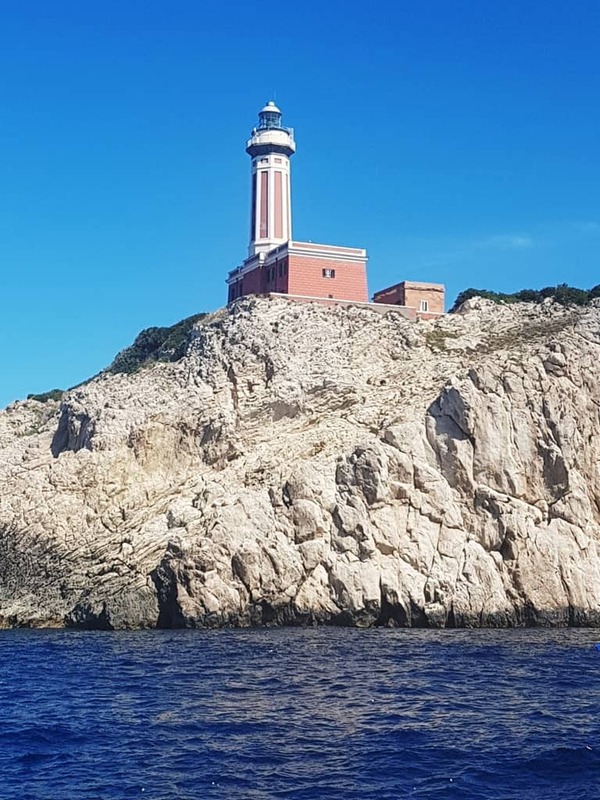 The Punta Carena Lighthouse, built in 1866, looks over the nearby Tyrrhenian Sea and is one of the tallest lighthouses in Italy. It’s a great place in Capri to catch the sunset or watch boats float by. When in Capri one definitely needs to set aside sometime to be at the beach. Capri is home to many different types of beaches most of which are either public or private. One public beach that’s quite the rave in Capri is Spiaggia Libera Marina Grande. This beach is family-friendly and features beautiful blue and green tinted waters you can swim in. You can also stop by Marina Piccola which is home to two cozy public beaches. The beaches provide clear views to I Faraglioni and are known for their tranquil and almost clear waters. Some beaches in Marina Piccola are also private and feature delicious restaurants, like Da Gioia which offers a mouthwatering array of seafood dishes. Besides this, you can also stop by Gradola, a public beach located near the Blue Grotto. This is one of the only free beaches on the island, so it can be a bit crowded. However, it offers great sunbathing and swimming spots for guests to enjoy. If you are on th esearch for a private beach to enjoy, you can check out Le Ondine and Lo Smeraldo in Marina Grande. Le Ondine is situated right next to a beach club where you can grab a drink or bite to eat while gazing out at the nearby sea. The beach also features chairs, umbrellas, and other helpful amenities you can use to ensure your stay is perfect. 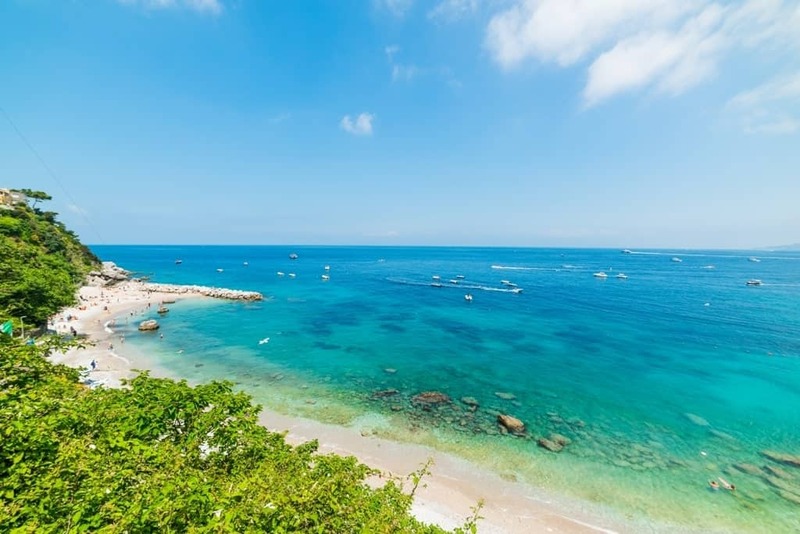 The other private beach, Lo Smeraldo, offers a fancy restaurant you can dine at while enjoying the soft sea breezes float by you and listening to the waves crash against the nearby rocks. This beach offers views of both the sea and the colorful houses that line the edge of the surrounding cliffs. Another great private beach in Capri to venture to is Bagni di Tiberio. This beach offers an exclusive restaurant built on a large rock so you can get a unique view while dining inside. If you’re not up for a large meal, you can also stop by the beach’s snack bar which offers a variety of small treats and delicious drinks you can try. Bagni di Tiberio is also home to Roman ruins which you can explore and swim around in. La Canzone del Mare has been a famous spot for many people to venture to throughout time. This exquisite beach club is known for being situated next to many of Capri’s coves and is one of the top spots to go swimming on the island. 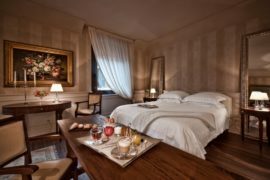 The club has astonishing views of I Faraglioni and offers cabanas and even pools you can enjoy. 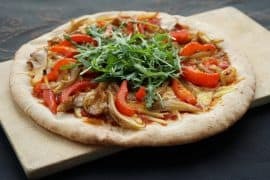 In addition to this, you’ll also find a top-of-the-art restaurant which provides amazing views out to sea and serves traditional Italian dishes. Capri is home to many famous brands worldwide which makes it a great place to go shopping. 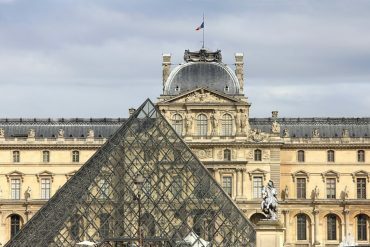 You’ll find authentic Gucci, Louis Vuitton, and Loro Piana shops you can wander around in. You’ll also find many small and local shops around, such as on Via Le Botteghe, which sell unique products you can buy, like handcrafted clutches and shoes. Capri also offers many food markets you can shop at where you’ll find fresh wine, cheese, and limoncello. 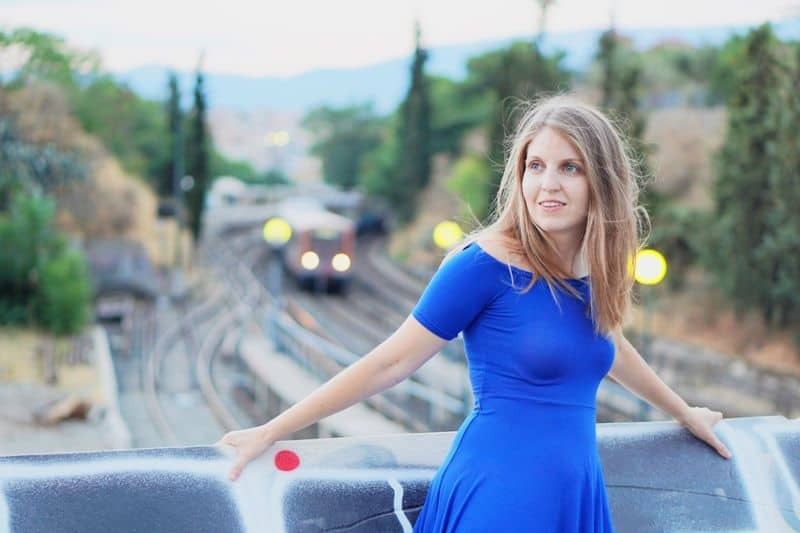 You might also be interested in: What to wear in Italy – a packing list for the summer. Capri Town is one of the two small towns on the island. 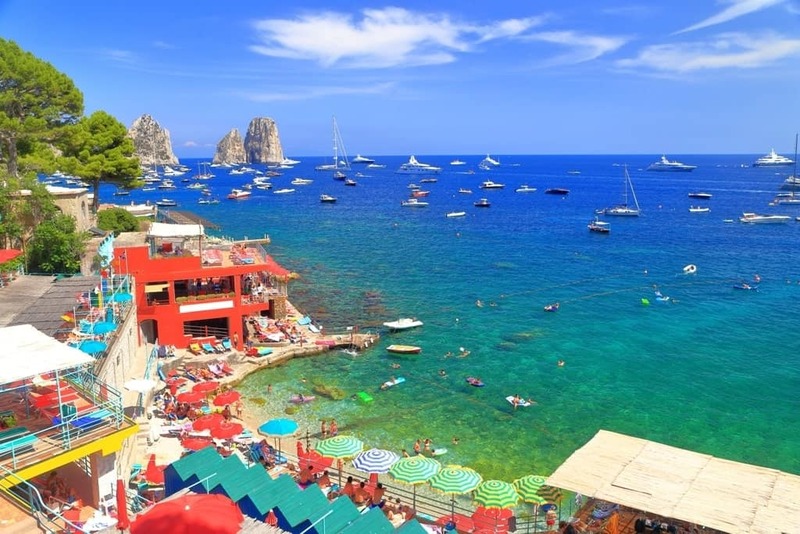 Capri Town is a bustling section known for its selection of designer shops, exquisite restaurants, and glamorous eateries. 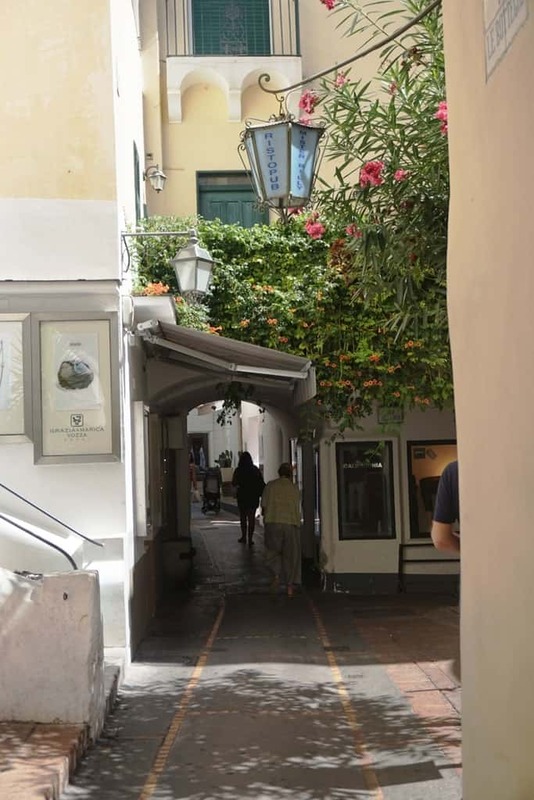 One popular spot to go to while in Capri Town is Piazzetta. This square offers many cafes you can stop by at as well as a breathtaking view of the sea. It’s truly a place every visitor to Capri needs to see before they leave. To reach Capri Town, you can hop on a bus to take you there or just take a quick walk up to it. You can even take the funicular if you want a unique experience. You can usually catch one of these cable car rides from Marina Grande. Villa Jovis, as mentioned earlier in this article, is a magnificent ruin of a former Roman castle built by Tiberius. The castle overlooks the sea and you can walk around on its grounds to not only tour the ruins and walk down crumbling staircases, but get incredible views of the island and sea. While here, you can also see the edge of a cliff where servants and guests were once thrown off if they were disobedient to the emperor. 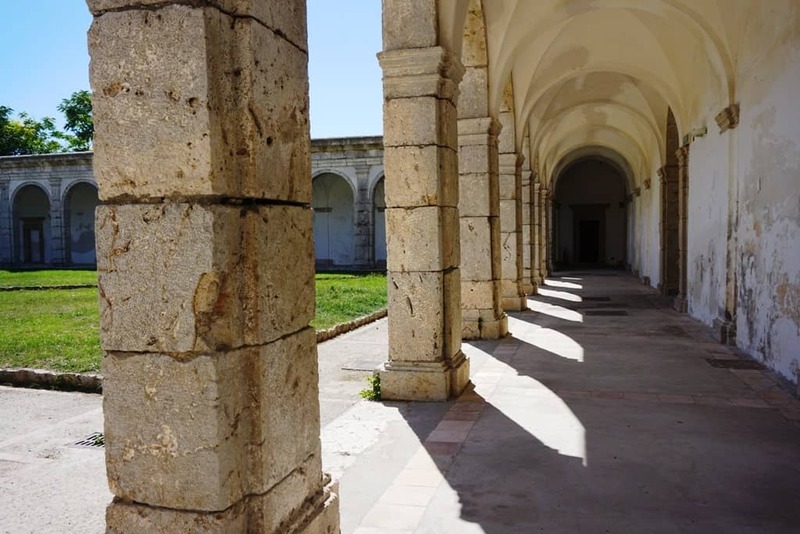 The Certosa di San Giacomo is a former monastery built in 1363 by Giacomo Arcucci. 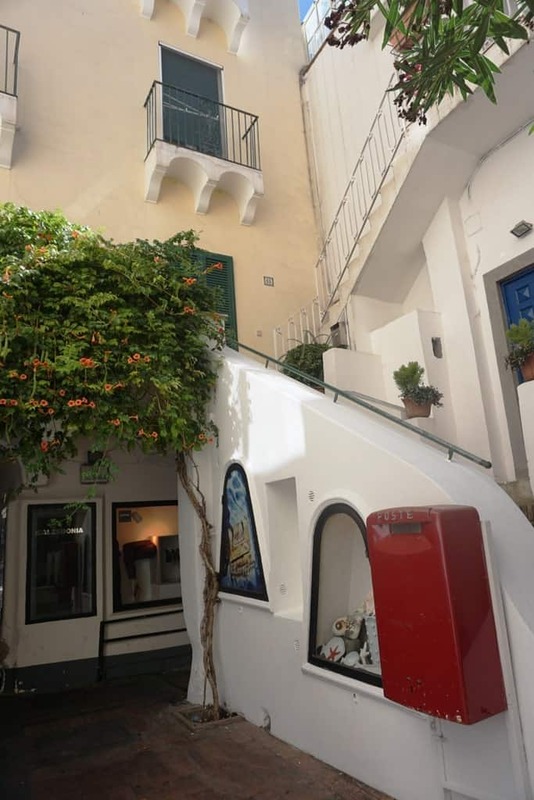 It is considered to be one of the oldest structures in Capri and offers numerous tours so you can explore its interior yourself. 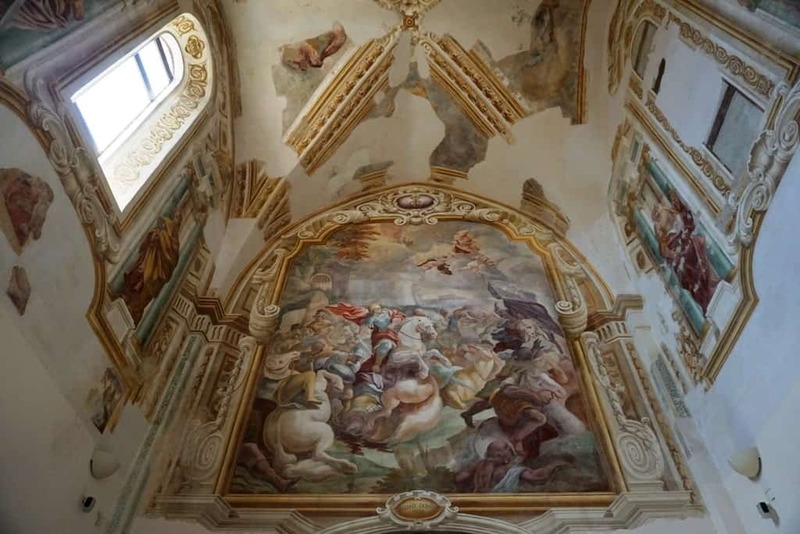 You’ll be able to see its former pharmacy, women’s church, and remarkable frescos. The Gardens of Augustus are a breathtaking spot to visit while in Capri. 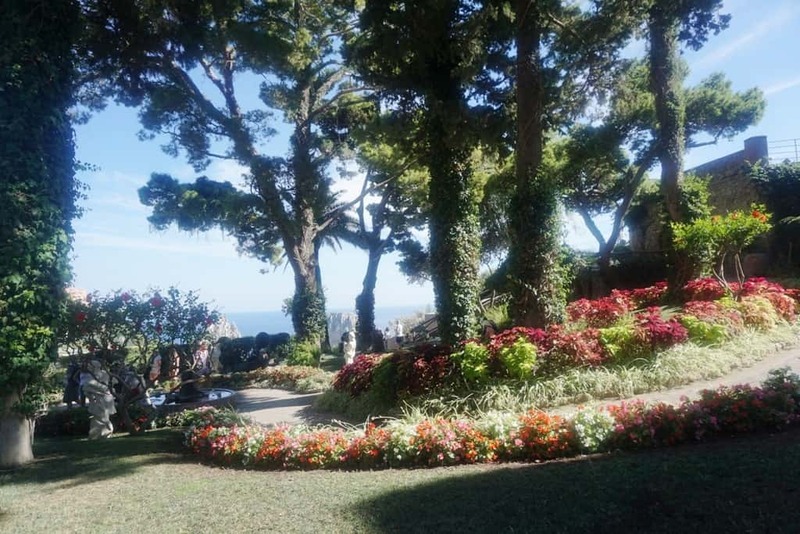 The gardens are known not only for their beautiful floral designs, but for its views of the sea which allow you to get even more glimpses of the iconic I Faraglioni. The gardens include a handcrafted seawall carved around the side of a cliff which you can walk on to get panoramic views of the sea around you. If you’re just planning to spend more than a day in Capri, I suggets that you do a day tour around the island. 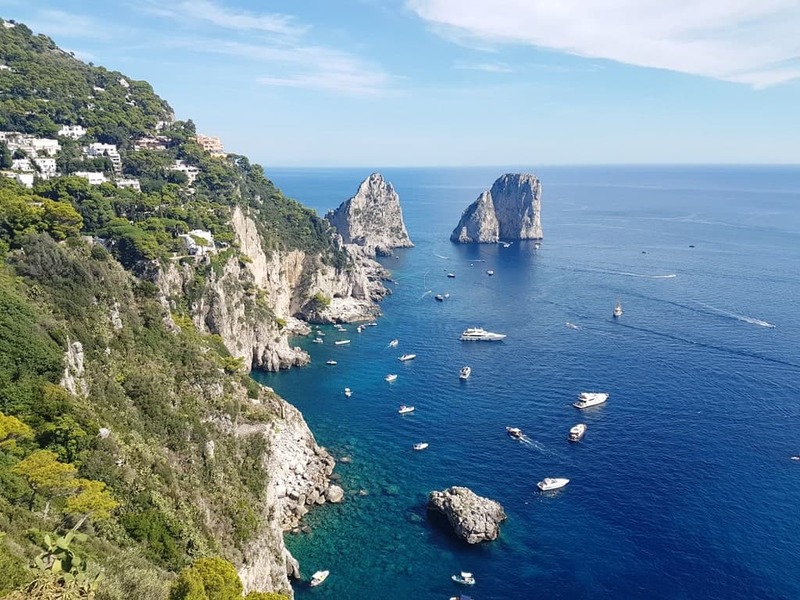 you can You’ll be taken around the coast on this 8-9 hour boat trip where you’ll be able to see Capri’s rugged cliffs and grottos and even take a quick swim or snorkeling adventure in the soothing sea water. 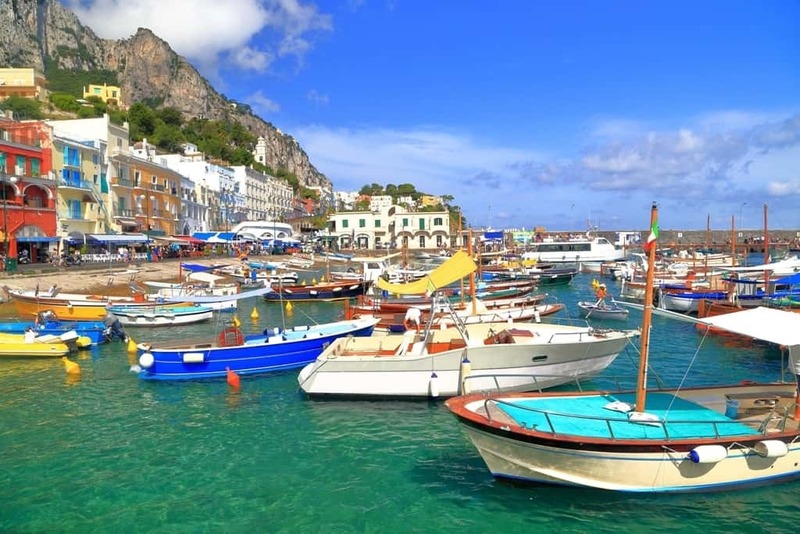 Capri is a dazzling Italian island that offers a little bit of everything. You’ll find tranquil beaches to relax at, energetic shopping areas, stunning gardens to wander through, and mouthwatering dishes to please your palate. If you’re looking for a destination to venture to, definitely keep Capri in mind. It will be an experience you’ll never forget. 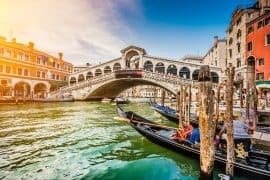 10 days in Italy including Rome, Florence, and Venice. 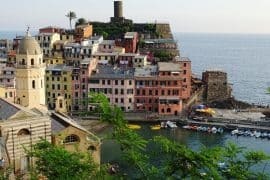 Two weeks in Italy an itinerary that includes the Amalfi, Rome, Florence, Venice, and Milan. How to spend 2 days in Venice. 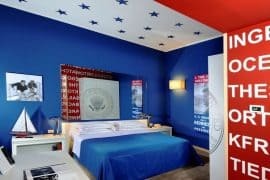 How to spend 5 days in Rome. 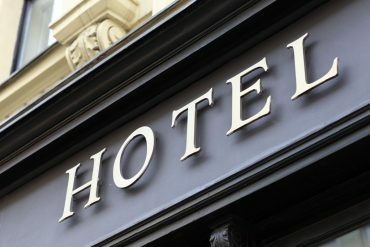 Where to stay in Rome a guide by a local. 20 Northern Italy cities you should visit. 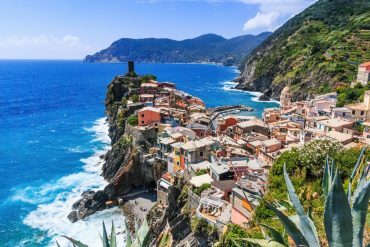 One day in Cinque Terre.